Here we are again, swanning around a sunny Caribbean whilst most of you are dealing with the rigours of a northern winter. Still it won’t be long before we are suffering with you. Or perhaps not…..
Lilly B was now back in the water and we thought we might at least spend a couple of days with them so began hauling the anchor soon after they left. It stuck. No matter what we tried and we had some very good advice we remained rooted to the seabed. Luckily a Spanish boat moored nearby had a PADI logo on its hull (something to do with diving) and after speaking with them they came over the following morning. The woman was the instructor and down she went 11 metres to check on what we had this time. No anchor but a massive ships chain, which we had somehow wrapped our piddling 3/8” around. It took her several attempts and only by undoing the anchor from our chain was she finally able to unravel the mess. So we reckon the 3 fouled anchors, in as many weeks, must mean we are now clear of that particular disaster area. So finally we left Chagoramas and headed around the corner to Scotland Bay. If you ever get the chance to come here it is absolutely wonderful. Well-sheltered and quiet with howler monkeys, parrots and dolphins in attendance, secure holding sheltered from the prevailing winds it is al most idyllic. Unfortunately it also attracts partygoers at the weekend with seriously loud music so we knew we had to leave before they arrived. At the last moment we decided to head to Los Testigo an island off the Venezuelan mainland and so the two Ferro gaffers, hulls built by the same man- Mick the Brick left on the overnight trip on Feb 20. And we’re still together a month later! We had intended to leave for Cuba from Testigo but each time it seems logical to go a little further. From Testigo we went onto Margarita where we cleared in, shopped and found diesel for 70 Bolivar’s a litre. Now as there are roughly 5000 B’s to a £ that made the diesel about 7p a gallon. So we bought 90 litres. It was less than a £. We were overjoyed. Until a few days later we began to notice a familiar smell coming from the jerry cans. A quick check revealed the diesel was in fact petrol. We had watched the stuff being poured in, we bought it a large garage and it came from a thin black hose. And I had asked for “Gasoil” but whatever, we certainly didn’t want it on board and solved the issue by donating it to a local fisherman. Luckily I hadn’t made the same error with the beers as they had cost a princely 6p a bottle. The fisherman was quite happy to accept the gratis fuel and promptly offered us several fish, which we declined apart from one for Toots who turned her nose up. 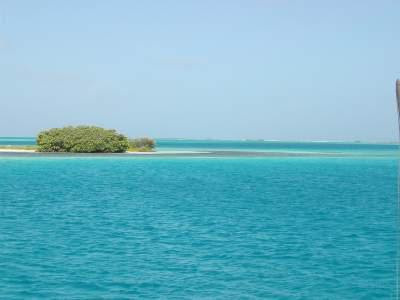 We sailed on, gradually moving west along a succession of islands that lie off the north Venezuelan coast. At Tortuga we anchored in picture perfect conditions. Dazzling white beaches, a sea so blue it could only have been dyed and only local fishing people as inhabitants. Come the weekend it changed as the affluent mainlanders flew in using small aircraft. Some passengers couldn’t be bothered to wait for landing and parachuted in. It all seemed out of step with the life on the island yet is possibly an apt metaphor for Venezuelan life. 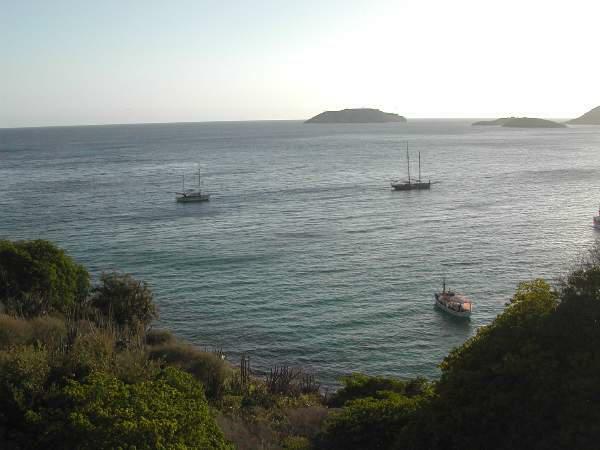 Lilly B crew arriving as pirates..
As an aside cruising in Venezuela is rife with rumours. Principally concerning piracy and violence it has stopped many yotties coming here. That it exists, piracy that is, is not in doubt and it was something we both felt we would avoid by staying away from the area. Having said that we both feel that the trip from Trinidad to here has been the best sailing, amongst the friendliest people that we have experienced. It may be that rumour and fear distort an innocuous occurrence into something potentially dangerous which is then repeated and distorted on retelling. Or it could simply be problems closer to the mainland. Who knows? From a cruising viewpoint these islands are wonderful and we’re both glad we came. 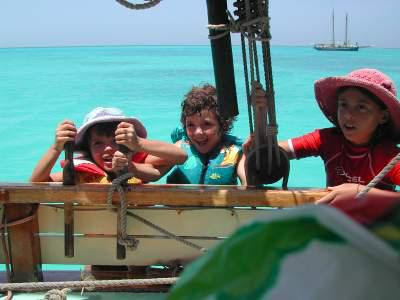 At Los Roques we joined Lilly B and a few others in a reef-protected anchorage that offered shelter and snorkelling. We joined them after a struggle as I couldn’t make sense of the chart and ran aground, luckily sand not coral and, once afloat, despite trying different approaches could not find a channel through. Eventually a local fisher man came out and guided us, accepting the beers we offered as thanks with a genuine reluctance. Pelicans abound in these waters, skimming low over the water in a feathered fly past; often at the same time of day and despite seeing almost daily we never tire of watching. In the town here we passed a pair of herons rooting amongst the grass for food, commonplace and ignored by locals but so unreal to us. And on the subject of unreal, whilst at anchor recently a brown boobie, a sea bird about the size of a gull flew about the boat and collided with a forestay causing it to plummet to the deck. Luckily for the bird though a little dazed it was unhurt and landed close to the capping rail (side of the boat) ‘cos Toots was on it in a flash. I say lucky for the bird but also for Toots as the beaks on these things are probably 5” long and would have done a lot of damage. 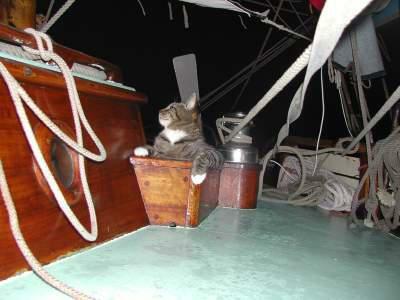 But Toots regained her territory and boobie scuttled off across the water to safety.